Work is starting to get busy and I’ve not got a lot of time to write long blog posts at the moment, so here’s some more random ‘short’ snippets on booze that I’ve managed to throw down my throat recently. In other news the blog was three years old last Friday. Which is quite scary. 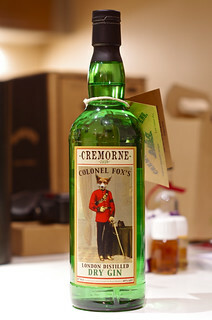 Cremorne 1859 Colonel Fox – A gin that has been on the shelf at work for a while and which I’ve been meaning to grab for a bit, if only because it has a fox in a military uniform on the bottle’s label. It’s (almost certainly) made at Thames Distillers in Clapham (CLASS magazine article about them over here) due to the boss of the distillery being one of the partners in the company selling it, the other partners being the brand company and an artist who has designed the labels. It’s a very traditional London gin and you can tell that from the tasting: On the nose there was citrus and some lightly piney juniper with soft coriander seed, hints of black pepper and sweet spice. It was quite oily and heavy in the mouth, with spicy juniper, sweet cinnamon, coriander, butter, hints of Maya Gold chocolate and a touch of cardboard. It finished with lemon zest, sweet spice and a light earthiness. Nothing out of the ordinary but a sold ‘ginny’ gin with good juniper and soft spice. Grant’s 25yo – This isn’t the first time I’ve either tried this or written it up on the blog, with a dinner with brand ambassador Ludo Ducrocq and a Whisky Squad of deconstructing it appearing in blog posts-passim, but I went along to the official UK launch recently and still really like it. It was a duty free exclusive that they’ve been talking about putting on general release for a while, but it looked like they were waiting for the first batch to run out so that they could roll-out batch two as the new whisky. However, it looks like they’ve still got a load of the batch one 25yo left, so it’s now hitting the wider market, although it’s starting out with being an exclusive in Selfridges until the new year. The new batch should be out early next year. Anyway, some tasting notes. On the nose it had a bit of a shopping list of ‘things that Billy likes’: waxed fruit, sweet apples, peach, Fruit Salad chews, tropical fruit sweets, pears, light spice, sweet pastry, musty fruit, pungent honey, sugared raisins, touches of glue, nuts and a little bit of window putty. To taste it was soft and oily with light black pepper, dried apple rings, hints of liquorice, orange peel, cinnamon and generally spicy wood. It finished with spicy oak, sour apple and perfumed wood, maybe sandalwood. I still like this and am pleased that it’s going to be a bit more available. It should be around the £200 mark next year, but for now it’s inflicted with a premium at Selfridges and is selling for £320. 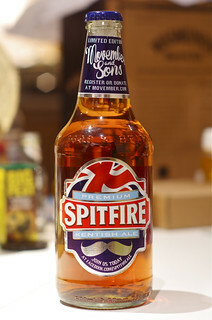 Shepherd Neame Spitfire – It’s November and as such I am growing a moustache in aid of Movember, as I have done for the last few years. 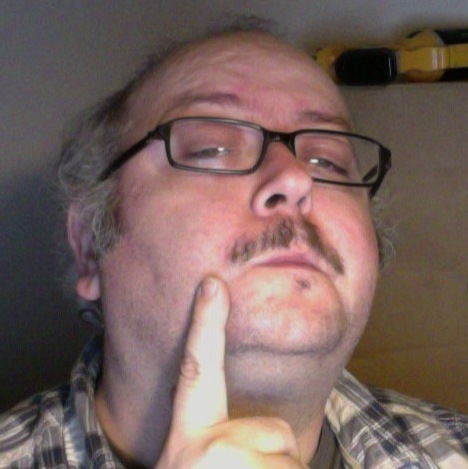 If you want to donate you can do so over here. I mention it here because Shepherd Neame are the official Movember beer partners for 2012 and I recently got a bottle as a ‘well done for growing a moustache’ gift from the PR people who are looking after the campaign for them. I also got some beer mats and a rubber Movember bracelet in a particularly unattractive shade of brown that, as with most other charity bracelets, is of a size that wearing it for any length of time would cause my hand to drop off. Spitfire was one of the beers of my late adolescence, with my under-18 beer drinking being aided in part by post cricket match pints. I was the team scorer and in addition to my £2.20 pay (20p per player) I also used to get bought a few beers – Spitfire was my tipple of choice in the Neame pub next to the cricket ground, famed for its well kept ale and lax approach to alcohol age restriction, if the minors in question were wearing cricket whites or clutching a scorebook. On the nose it had classic best bitter notes of biscuity malt and spicy green hops, with a hint of ginger. To taste it led with green hops and sour fruit juice, backed up with seeded bread. It finished with a lingering bitterness balanced by sweet malt and sour fruit. All in all a solid ale but not one that I find particularly exciting – I’ve been spoiled in the years since my cricket scoring days. Grand Marnier Cordon Rouge – Another random gift from a PR company, this time due to one of Grand Marnier’s occasional foibles – they love special edition bottles. All summer at work we had their official 2012 special edition, a white plastic clad bottle with a red ribbon motif, and they’ve now released a new one in time for Christmas – The Paris Limited Edition. 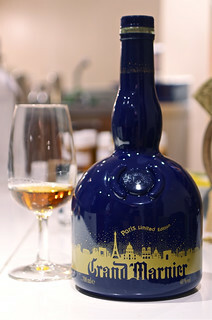 It’s a dark blue bottle with a Parisian skyline, but it’s otherwise the same liqueur as usual – a heavily cognac based (I seem to remember the number 50% being bandied around) liqueur, flavoured with orange, herbs and spices. On the nose one flavour swamps the rest – candied mixed peel, although biased towards orange peel. It has the sticky sweetness as well as the spicy Christmas cake-y notes that I associate with the remains of a tub bought the previous year to make Christmas related baked goods and then left unfinished until the following December. In the mouth it was thick and sticky with sweet syrup balanced by zingy orange peel citrus, backed up by dark caramel chocolate and a pinch of spicy cinnamon. It finished sweet, with lingering spice, a hit of alcohol and some Terry’s Dark Chocolate Orange.